As Hurricane Irma approaches U.S. shores, researchers sponsored by the Office of Naval Research (ONR) are using air-dropped autonomous sensors to compile real-time ocean observations to help forecasters predict the strength of future tropical storms. This marks the first time the sensors–called ALAMO (Air-Launched Autonomous Micro Observer) sensors–are being used in hurricane-prediction research. While standard computerized prediction models rely on atmospheric data like air temperature, humidity, altitude, and wind speed and direction, the ALAMO sensors (sponsored by ONR) measure oceanographic phenomena beneath the sea surface. "Hurricanes like this have a devastating impact on coastal regions, and our thoughts and prayers are with the affected communities," said Chief of Naval Research Rear Adm. David J. Hahn. "Often, there is an intersection of military and civilian needs. If we can improve the lead time and accuracy of storm forecasts, it would give national and local leadership more time and detailed information for preparations, evacuation or shelter-in-place decisions." Fully developed tropical cyclones–called hurricanes or typhoons, depending on their region–can grow as wide as several hundred miles and sustain winds greater than 150 miles per hour. With historically high winds, Hurricane Irma is one of the strongest storms ever recorded in the Atlantic Ocean. Such storms are notoriously difficult to predict, presenting a volatile meteorological cocktail that can change direction, speed and strength–quickly and unexpectedly. One reason is that current forecasting models focus on the atmosphere, instead of underwater properties that contribute to the creation of hurricanes, but are difficult to observe. In addition to the potential catastrophic damage to coastal communities, hurricanes also pose a severe threat to U.S. Navy fleet operations. Accurate forecasting is critical for protecting ships at sea, evacuating vulnerable bases, and performing humanitarian assistance and disaster relief. Earlier this week, the ONR-sponsored research team–composed of U.S. 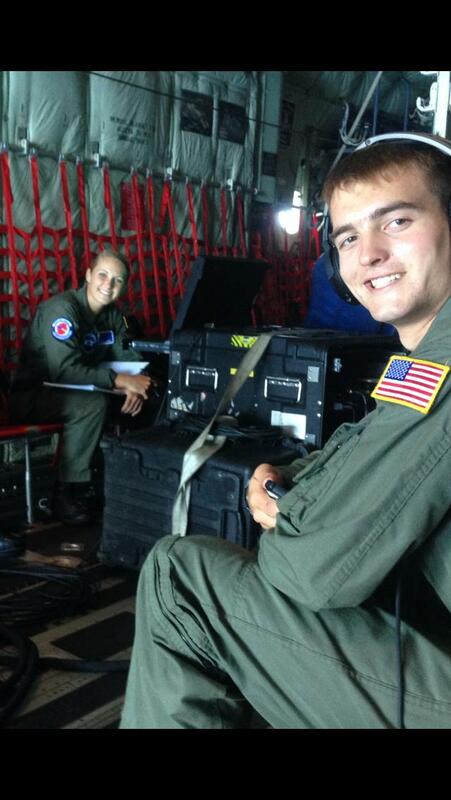 Naval Academy midshipmen and scientists from Woods Hole Oceanographic Institution–dropped ten ALAMO sensors from an Air Force C-130 "Hurricane Hunter" aircraft into Caribbean waters off the coast of Florida, ahead of the storm. The sensors are continuing to make observations and will also be used to track ocean dynamics in the approaching Hurricane Jose. Short, metal tubes crammed with sensors and scientific instruments, each ALAMO sensor sank nearly 1,000 feet underwater and then rose again. They've been tracking ocean temperature, salinity and pressure, and transmitting this data via satellite, for use by the Naval Research Laboratory to update the Navy's coupled ocean-atmosphere forecasting models. "The ALAMO sensors will enable us to get an accurate picture of conditions in the water column–before, during and after a hurricane," said Capt. Elizabeth Sanabia, an oceanography professor at the Naval Academy, who is overseeing the research. "For the Navy, this improved forecasting will increase operational readiness and mitigate risk. For the nation, it will result in better response planning and potentially save lives." The participating Naval Academy midshipmen were Casey Densmore, Kelli Wise and Rachel Boushon. Once the immediate danger of Hurricane Irma has passed, the information accumulated by Sanabia's team will be used to improve the Navy's Coupled Ocean/Atmosphere Mesoscale Prediction System-Tropical Cyclone–COAMPS-TC, for short. COAMPS-TC, developed with ONR support, uses complex algorithms to predict hurricane intensity–by processing real-time and historical meteorological data, fed by information from satellites. "Our goal is to improve ocean and atmosphere modeling and prediction for fleet operations," said Dr. Ronald Ferek, a program manager in ONR's Ocean Battlespace Sensing Department. "The real-time COAMPS-TC forecasts for Hurricane Irma help the Navy issue operational guidance for fleet safety, and improve understanding of the complex air-sea interaction processes that drive the intensity of tropical hurricanes." ONR's sponsored hurricane research is part of the Task Force Ocean initiative, which seeks to strengthen the Navy's oceanographic capabilities in ocean sensing and modeling technology.